All of our socks are made here in New Zealand. 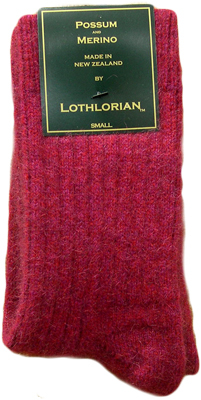 We have a variety of socks for men and women, and the socks on this page are all very popular in store sellers. The ladies comfort socks (or bed socks) are a big hit as they are usually worn to bed on a cold winters night. Often many people just wear them as they always have cold feet so its keeps them cuddly and warm. Check out the colourful kiwi and sheep bedsocks. We also stock the mens bed socks, very popular also.